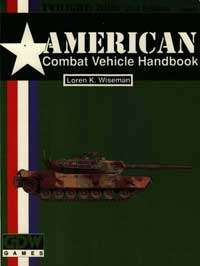 American Combat Vehicle Handbook supplements and extends the basic vehicle listing provided with the 2nd edition Twilight: 2000 rules. More then 60 vehicles are represented(only 11 repreated from the basic game), ranging from the latest variations on the M1 Abrams to the M42 Duster 40mm self propelled antiaircraft vehicle. vehicles include four verions of the Bradley IFV, the M151 Jeep, M42 Duster, M551 Sheridan, M728 CEV, M48A3, M88 ARV, M109, M110, and many other vehicles in current or recent services with the U.S. Army. In addition, the American Combat Vehicle Handbook includes three prototype combat hovercraft and two experimental laser air defense self-propelled artiller vehicles. All vehicles are completely described for use in the Twilight:2000 games, but the data is presented so as to be of interest to modern vehicle enthusiasts even if they don't play Twilight: 2000 or any game at all. To top it off, the vehicle guide includes eight pages of color plates showing representative vehicles in their field color schemes-a tremendous resource for monder vehicle enthusiasts, modelers, referees, or players who wonder what their tank might look like.